Domaine Roche Audran has a history in the Southern Rhone Valley as a vineyard. But until 1998, the estate was selling their entire harvest to the local cooperative. In 1998 things changed when Vincent Rochette made the decision to begin to produce, bottle and sell wines under their own name, Domaine Roche Audran. Vincent Rochette remains in charge of the domaine today. Domaine Roche Audran also produces red wine and white wine from the Cotes du Rhone Villages appellation, where they own vines planted in Buisson, Courthezon and Visan. Domaine Roche Audran owns a very small parcel of vines in the Chateauneuf du Pape region. At least that’s the situation for the time being. They produce one red wine from .33 hectares of vines that are situated in good terroir in the lieu-dit of Cristia. The vines are getting old, as they were planted in 1962. The vineyard has a terroir of mostly sand, along with small rocks and stones in the soils. The vines are not that far from Chateau Rayas in the northeast part of the appellation. All vineyard farming techniques used at Domaine Roche Audran have been 100% biodynamic since the 2009 vintage. They adhere to the full range of biodynamic farming ideas including follow the lunar cycles and planetary alignments as set forth by Rudolf Steiner. Domaine Roche Audran produces 1 Chateauneuf du Pape Rouge wine. Domaine Roche Audran Chateauneuf du Pape is made from 100% Grenache. The wine is aged in a combination of French oak barrels and demi muids for 12 months before bottling. The estate follows the biodynamic calendar when it comes to aging process as well as the racking and bottling are set to lunar cycles. As you can imagine, with only .33 hectares of vines, the wine is quite difficult to find. Domaine Roche Audran can be enjoyed on the young side. Young vintages can be popped and poured, or decanted for about 1 hour. Older vintages might need very little decanting, just enough to remove the sediment. Domaine Roche Audran is usually better with 3-4 years of bottle age. Of course that can vary slightly, depending on the vintage. In the best vintages the wine should be consumed within 3-12 years after the vintage. 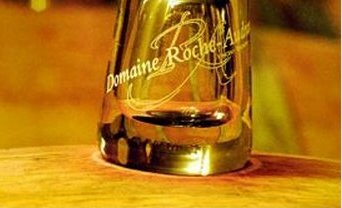 Domaine Roche Audran is best served at 15.5 degrees Celsius, 60 degrees Fahrenheit. The cool, almost cellar temperature gives the wine more freshness and lift. Domaine Roche Audran is best served with all types of classic meat dishes, veal, pork, beef, lamb, duck, game, roast chicken, roasted, braised, stewed dishes, sausage, grilled meats, barbecue and cassoulet. Domaine Roche Audran is also good with Asian dishes, hearty fish courses like tuna, mushrooms, cheese, pasta, eggplant and tomatoes. Fresh, spicy, round, forward, medium bodied and with a sweet kirsch and black raspberry center, making the wine an early drinking charmer. Medium bodied, soft, almost lushly textured, kirsch and assorted red berry filled wine with loads of pepper, garrigue and thyme to flesh things out. Slightly drying, with more stone, peppery and herbs than fruits at this stage. It could improve. The fruit is ripe and tasty. But I’d drink this over the next few years. From 100% Grenache, the wine feels great, with its lush, soft, ripe, sweet, fresh fruits. The floral, garrigue, kirsch, spice and licorice nose is just what the doctor ordered.